What happens if someone, uninvited and without notice, enters a restricted area of your Florida community’s property and slips and falls, such as on a wet floor? Can the uninvited interloper sue the owner or association for his or her injuries? The liability answer may depend on whether the owner or association knew that the interloper was on the property. Perhaps, ignorance is bliss? A recent Florida appellate court decision provided the uninvited visitor a tentative victory by reversing a trial court’s judgment for a hospital because there was genuine issue of material fact whether the hospital knew about a wet floor and a hospital visitor’s presence in the kitchen before her fall. In Denniser v. Columbia Hospital Corporation of South Broward, 39 Fla. L. Weekly D990 (Fla. 4th DCA, May 14, 2014), the facts indicate that Ms. Denniser was visiting her mother while her mother was a patient in the hospital. During one of her visits to the hospital, Ms. Denniser entered a staff kitchen to obtain tea. The door to the kitchen was closed but unlocked. A sign on the wall outside of the kitchen door read “PANTRY” and “STAFF ONLY.” While in the kitchen, Ms. Denniser slipped and fell on the wet floor. Ms. Denniser sued the hospital for negligence, claiming that she was in the hospital as an “invitee” of the hospital’s business, and that the hospital breached its duty of care to her by failing to warn her of the dangerous and concealed condition of the wet floor. The hospital’s risk manager testified that the kitchen area was to be used only by employees and staff of the hospital, and the area was not to be used by patients or visitors. The hospital argued that Ms. Denniser lost her status as an “invitee” and became an uninvited licensee or trespasser by entering the kitchen, which was beyond the scope of her “invitation.” The trial court accepted the argument and granted summary judgment for the hospital. MICHAEL J. GELFAND, ESQ., SENIOR PARTNER OF GELFAND & ARPE, P.A. The Florida appellate court agreed that Ms. Denniser lost her status as an invitee, becoming either an uninvited licensee or trespasser by entering an area of the hospital that was beyond the scope of Ms. Denniser’s invitation. The hospital argued it was only required to warn Ms. Denniser of concealed dangers if her trespass was discovered. However, the hospital maintained that Ms. Denniser was an “undiscovered” trespasser. The appellate court’s explanation is important for associations, holding that the duty to warn an uninvited licensee or trespasser of known, concealed dangers only arises when the owner discovers the presence of the person. Nevertheless, the appellate court determined that the trial court erred in granting summary judgment because the evidence did not establish that the hospital was not aware of Denniser’s presence in the kitchen before she fell. The lesson to be learned here is that a Florida property owner, including community associations, should try and keep property free and clear of any dangers, such as a wet floor, particularly in a building’s entrance way. Once you are aware that a visitor or trespasser is on the property, you have a duty to warn that visitor or trespasser of any concealed dangers. Note that it is unlikely that in the long run ignorance is bliss, and that owners and associations should anticipate issues, and post appropriate warnings in advance of situations and injuries. What happens if an association levies a special assessment after it has filed a lien foreclosure action against an owner for unpaid assessments? Can that special assessment be included in a foreclosure judgment? Perhaps not. 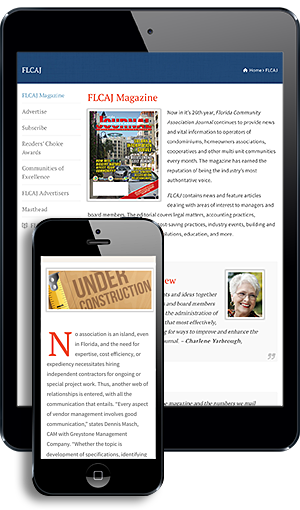 A significant holding, challenging assumptions of decades, is found in Losner v. The Australian of Palm Beach Condominium Association, Inc., No. 4D13-1669 (Fla. 4th DCA, June 11, 2014). The Australian of Palm Beach Condominium Association filed a lien foreclosure action against a unit owner for unpaid assessments. The trial court granted summary judgment of foreclosure on the unpaid assessments, including assessments due after the claim of lien was recorded. Section 718.116(5)(b), Florida Statutes, states that a claim of lien by a condominium association for unpaid assessments “secures all unpaid assessments that are due and that may accrue after the claim of lien is recorded and through the entry of final judgment.” However, the “word ‘accrue’ references assessments already made before a claim of lien is filed, but coming due afterwards[,]” but it does not refer to additional assessments for other purposes, such as separate assessments that are assessed against an owner after the time the complaint to foreclose on a claim of lien is filed. Thus, the appellate court focused on the failure to plead assessments that are levied after creation of the lien, which creates a due process violation. In other words, the court ruled that a condominium association cannot “piggyback” new, claimed assessments onto those assessments detailed in the claim of lien and the complaint. Any assessment, which has not yet been levied when the claim of lien is recorded, presumably cannot be included in the judgment. It is noted that all is not lost for associations since most of the foreclosures filed by the firm include a count for money damages, which this decision does not impact.